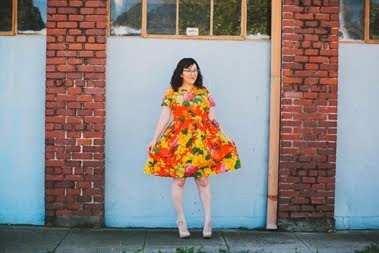 A few weeks ago Rochelle posted about a free class on Craftsy. 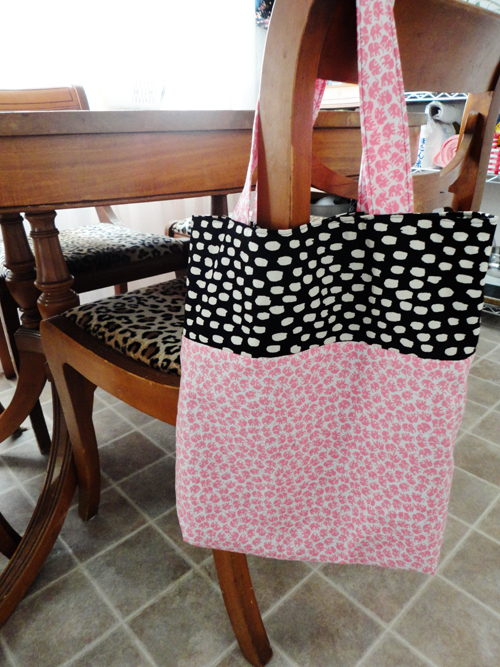 At the time I had not taken any of their paid or free classes, but when I read Rochelle's post I became interested in the class on making simple tote bags. My interest was piqued for a couple of reasons. One, in San Luis Obispo County (where I live) a recent ban on plastic bags went into effect. Basically, at every large store (large is determined by building square footage), like grocery stores or Target for example, plastic bags are no longer offered and paper bags are available for a fee of ten cents per bag. I have no problem with this, but I have a problem remembering to take my bags inside the store with me! I figured that if I made some cute totes it might help me remember. I made this tote with my friend Shawntel in mind, she loves elephants and has a huge elephant tattoo on her arm! It's hard to see in the picture, but the fabric is an elephant print. The tote has a square bottom, which I like. 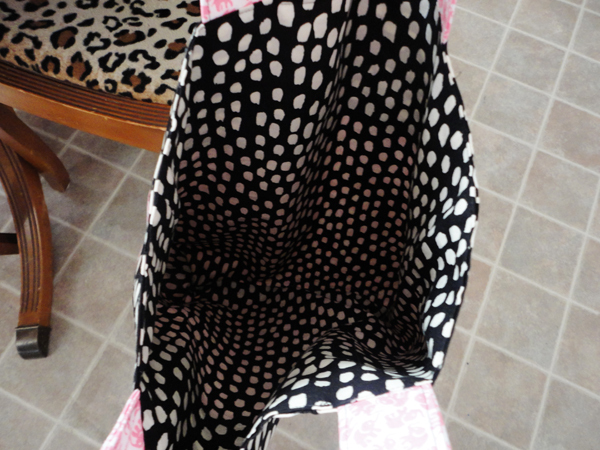 Oh, I didn't add pockets to the inside because it's more of a grocery bag than a purse. The way the instructor sews the pockets is super neat and I want to incorporate them into a future bag. I'd take the class just for her tip on sewing the pockets! I was down in Paso last week for Thanksgiving and I was pretty surprised when Target told me it was 10 cents a bag. It's nothing new for me because San Francisco has a similar kind of thing and I'm used to it. But, man, my parents are not happy! This definitely inspires me to make my parents some grocery bags for Christmas this year!! Great job, Erin!! It turned out great! Very cute too :) I definitely need to make some grocery bags for myself. Awesome idea. I downloaded that class too, but haven't tried it yet. Glad to hear that you liked it. I'm bad at remembering to bring my own bags too, so maybe this will motivate me. Cute bag! Thanks for sharing, I'd love to try this tutorial (and more) out! So cute! What a great gift! I'm a huge Craftsy fan. I seem to collect their classes like it's my job. I haven't seen this free one though - at least I don't think I have. I'm off to Craftsy to look for it! That's awesome! (Both the ban and your bag). I never thought to sew my own reusable bags but that's a great idea, law or not! I try to use reusable bags whenever I remember, but still I somehow have acquired a mountain of plastic under my sink. Very cute! I need to make some of these for myself but knowing myself I'd probably forget to take them with me. lol! But I totally think it would be worth the look on my husband's face next time we go grocery shopping and I hand these to the bag boy. He already calls me a hippie because I've invaded our "party" room with recycle bins.